Item-level data from Raven’s Standard Progressive Matrices was compiled for 12 diverse groups from previously published studies. The method of correlated vectors was used on every possible pair of groups with available data (45 comparisons). Depending on exact method chosen, the mean and mean MCV correlation was about .46/51. Only 2/1 of 45 were negative. 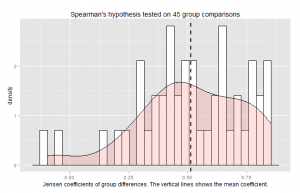 Spearman’s hypothesis is confirmed for item-level data from the Standard Progressive Matrices. The method of correlated vectors (MCV) is a statistical method invented by Arthur Jensen (1998, p. 371, see also appendix B). The purpose of it is to measure to which degree a latent variable is responsible for an observed correlation between an aggregate measure and a criteria variable. Jensen had in mind the general factor of cognitive ability data (the g factor) as measured by various IQ tests and their subtests, and criteria variables such as brain size, however the method is applicable to any latent trait (e.g. general socioeconomic factor Kirkegaard, 2014a, b). When this method is applied to group differences, particularly ethnoracial ones, it is called Spearman’s hypothesis (SH) because Spearman was the first to note it in his 1927 book. By now, several large studies and meta-analysis of MCV results for group differences have been published (te Nijenhuis et al (2015a, 2015b, 2014), Jensen (1985)). These studies generally support the hypothesis. Almost all studies use subtest loadings instead of item loadings. This is probably because psychologists are reluctant to share their data (Wicherts, et al, 2006) and as a result there are few open datasets available to use for this purpose. Furthermore, before the introduction of modern computers and the internet, it was impractical to share item-level data. There are advantages and disadvantages to using item-level data over subtest-level data. There are more items than subtests which means that the vectors will be longer and thus sampling error will be smaller. On the other hand, items are less reliable and less pure measures of the g factor which introduces both error and more non-g ability variance. The recent study by Nijenhuis et al (2015a) however, employed item-level data from Raven’s Standard Progressive Matrices (SPM) and included a diverse set of samples (Libyan, Russian, South African, Roma from Serbia, Moroccan and Spanish). The authors did not use their collected data to its full extent, presumably because they were comparing the groups (semi-)manually. To compare all combinations with a dataset of e.g. 10 groups means that one has to do 45 comparisons (10*9/2). However, this task can easily be overcome with programming skills, and I thus saw an opportunity to gather more data regarding SH. The data in the papers did usually not contain the actual factor loadings of the items. Instead, they contained the item-whole correlations. The authors argue that one can use these because of the high correlation of unweighted means with extracted g-factors (often, r=.99, e.g. Kirkegaard, in review). Some studies did provide both loadings and item-whole correlations, yet the authors did not correlate them to see how good proxies the item-whole correlations are for the loadings. I calculated this for the 4 studies that included both metrics. Results are shown in Table 2. Table 2 – Item-whole correlations x g-loadings in 4 studies. Note: Within sample correlations between item-whole correlations and item factor loadings are in the diagonal, marked with italic. As can be seen, the item-whole correlations were not in all cases great proxies for the actual loadings. To further test this idea, I calculated the item-whole correlations and the factor loadings (first factor, minimum residuals) in the open Wicherts dataset (N=500ish, Dutch university students, see Wicherts and Bakker 2012) tested on Raven’s Advanced Progressive Matrices. The correlation was .89. Thus, aside from the odd result in the W2 sample, item-whole correlations were a reasonable proxy for the factor loadings. If two groups are tested on the same test and this test measures the same trait in both groups, then even if the groups have different mean trait levels, the order of difficulty of the items or subtests should be similar. Rushton et al (2000, 2002, 2007) have examined this in previous studies and found it generally to be the case. Table 3 below shows the cross-sample correlations of item difficulties. The mean intercorrelation is.88. This is quite remarkable given the diversity of the samples. Given the above, one might expect similar results for the item-whole correlations. This however is not so. Results are in Table 4. Note: The last two samples, NA1 and W4, did not have item-whole correlation data. The reason for this state of affairs is that the factor loadings change when the group mean trait level changes. For many samples, most of the items were too easy (passing rates at or very close to 100%). When there is no variation in a variable, one cannot calculate a correlation to some other variable. This means that for a substantial number of items for multiple samples, there was missing data for the items. The lack of cross-sample consistency in item-whole correlations may also explain the weak MCV results in Diaz et al, 2012 since they used g-loadings from another study instead of from their own samples. Some of the sample had rather low sample sizes (I2, N=58, W3, N=86). Thus one might get the idea to use the item-whole correlations from one or more of the large samples for comparisons involving other groups. 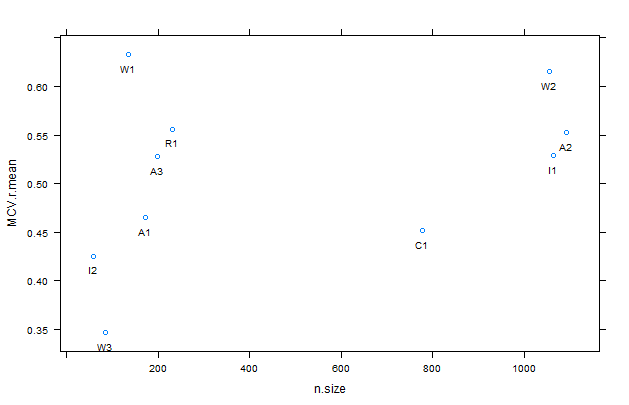 In fact, given the instability of item-whole correlations across sample as can be seen in Table 4, this is a bad idea. However, for sake of completeness, I calculated the results based on this anyway. As the best estimate of factor loadings, I averaged the item-whole correlations data from the four largest samples (W2, C1, I1 and A2). Using this vector of item-whole correlations, I used MCV on every possible sample comparison. Because there were 12 samples, this number is 66. MCV analysis was done by subtracting the lower scoring sample’s item difficulties from the higher scoring sample’s thus producing a vector of the sample difference on each item. This vector I correlated with the vector of item-whole correlations. The results are shown in Table 5. As one can see, the results are all over the place. The mean MCV correlation is .12. Since item-whole correlations varied from sample to sample, another idea is to use the samples’ item-whole correlations. I used the unweighted mean of the item-whole correlations for each item (te Nijenhuis et al used a weighted mean). In some cases, only one sample has item-whole correlations for some items (because the other sample had no variance on the item, i.e. 100% get it right). In these cases, one can choose to use the value from the remaining sample, or one can ignore the item and calculated MCV based on the remaining items. I calculated results using both methods, they are shown in Table 6 and 7. Nearly all results are positive using either method. The results are slightly stronger when ignoring items where both samples do not have item-whole correlation data. A better way to visualize the results is to use a histogram with a density curve inputted, as shown in Figure 1 and 2. Note: The vertical line shows the mean value. The mean/median result for method 1 was .51/.50, and .46/.48 for method 2. Almost all MCV results were positive, there were only 2/45 that were negative for method 1, and 1/45 for method 2. It is interesting to examine the mean MCV value by sample. They are shown in Table 7. There is no obvious racial pattern. Instead, one might expect the relatively lower result of some samples to be due to sampling error. MCV is extra sensitive to sampling error. If so, the mean correlation should be higher for the larger samples. To see if this was the case, I calculated the rank-order correlation between sample size and sample mean MCV, r=.45/.65 using method 1 or 2 respectively. Rank-order was used because the effect of sample size on sampling error is non-linear. Figure 3 shows the scatter plot of this. One can also examine sample size as a moderating variable as the comparison-level. This increases the number of datapoints to 45. 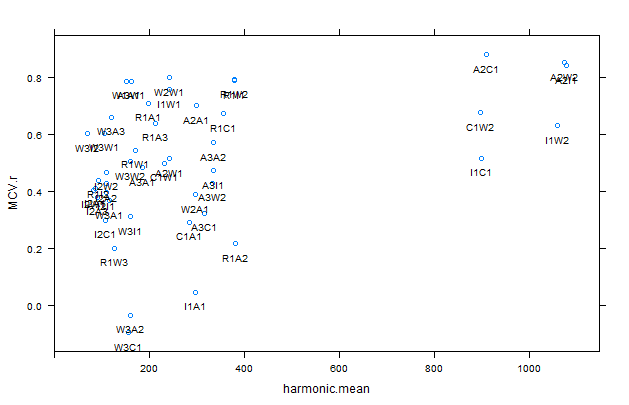 I used the harmonic mean of the 2 samples as the sample size metric. Figure 4 shows a scatter plot of this. The rank-order correlations are .45/.44 using method 1/2 data. We can see in the plot that the results from the 6 largest comparisons (harmonic mean sample size>800) range from .52 to .88 with a mean of .74/.73 and SD of .15 using method 1/2 results. For the smaller studies (harmonic mean sample size<800), the results range from -.09/-.08 to .89/.79 with a mean of .48/.43 and SD of .22/.23 using method 1/2 results. The results from the smaller studies vary more, as expected with their higher sampling error. I also examine the group difference size as a moderator variable. I computed this as the difference between the mean item difficulty by the groups. However, it had a near-zero relationship to the MCV results (rank-order r=.03, method 1 data). Spearman’s hypothesis has been decisively confirmed using item-level data from Raven’s Standard Progressive Matrices. The analysis presented here can easily be extended to cover more datasets, as well as item-level data from other IQ tests. Researchers should compile such data into open datasets so they can be used for future studies. It is interesting to note the consistency of results within and across samples that differ in race. Race differences in general intelligence as measured by the SPM appear to be just like those within races. R code and dataset is available at the Open Science Framework repository. Dıaz, A., & Sellami, K. Infanzó n, E., Lanzó n, T., & Lynn, R.(2012). A comparative study of general intelligence in Spanish and Moroccan samples. Spanish Journal of Psychology, 15(2), 526-532. Jensen, A. R. (1985). 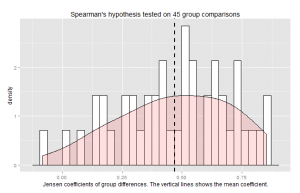 The nature of the black–white difference on various psychometric tests: Spearman’s hypothesis. Behavioral and Brain Sciences, 8(02), 193-219. Kirkegaard, E. O. (2014a). The international general socioeconomic factor: Factor analyzing international rankings. Open Differential Psychology. Kirkegaard, E. O. (2014b). Crime, income, educational attainment and employment among immigrant groups in Norway and Finland. Open Differential Psychology. Kirkegaard, E. O. W. (in review). Examining the ICAR and CRT tests in a Danish student sample. Open Differential Psychology. Owen, K. (1992). The suitability of Raven’s Standard Progressive Matrices for various groups in South Africa. Personality and Individual Differences, 13(2), 149-159. Rushton, J. P., Čvorović, J., & Bons, T. A. (2007). General mental ability in South Asians: Data from three Roma (Gypsy) Communities in Serbia. Intelligence, 35, 1-12. Rushton, J. P., Skuy, M., & Fridjhon, P. (2002). Jensen effects among African, Indian, and White engineering students in South Africa on Raven’s Standard Progressive Matrices. Intelligence, 30, 409-423. Rushton, J. P., & Skuy, M. (2000). Performance on Raven’s Matrices by African and White university students in South Africa. Intelligence, 28, 251-265. Spearman, C. (1927). The abilities of man. te Nijenhuis, J., David, H., Metzen, D., & Armstrong, E. L. (2014). Spearman’s hypothesis tested on European Jews vs non-Jewish Whites and vs Oriental Jews: Two meta-analyses. Intelligence, 44, 15-18.
te Nijenhuis, J., van den Hoek, M., & Armstrong, E. L. (2015b). Spearman’s hypothesis and Amerindians: A meta-analysis. Intelligence, 50, 87-92. Wicherts, J. M., Borsboom, D., Kats, J., & Molenaar, D. (2006). The poor availability of psychological research data for reanalysis. American Psychologist, 61(7), 726. Wicherts, J. M., & Bakker, M. (2012). Publish (your data) or (let the data) perish! Why not publish your data too?. Intelligence, 40(2), 73-76.